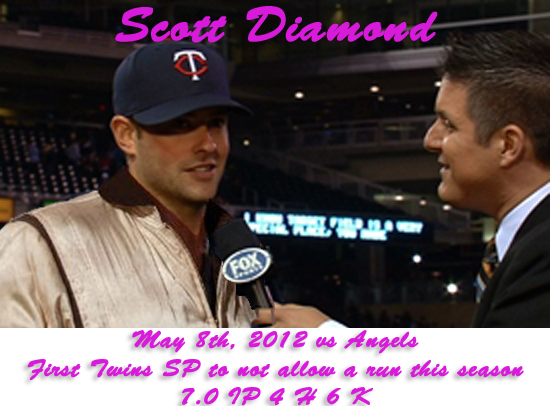 TTBB’s Scorpion Jacket Hall of Excellence Adds Diamond | That's Twins Baseball. A Minnesota Twins Blog. SOMEWHERE AWESOME — Well it was just what the Twins needed. On a nightly basis, the Twins starting staff has been letting the game get out of hand early, putting the offense in a hole that was impossible to climb out of. The only thing they didn’t do is tell the offense to put the lotion in the basket while they were down in the hole. In his first start after being called up from Triple-A Rochester, Diamond did something no Twins starter had accomplished yet this season: hold the other team scoreless. For that, it was a pretty easy choice for the committee here at TTBB to add him to the prestigious Scorpion Jacket Hall of Excellence. Congrats Scott. You’ve now been enshrined in TTBB’s SJHOE along with the other members found here. Butera Inducted Into TTBB’s Scorpion Jacket Hall of Excellence…Immediately Attracts Hollywood Girl Who Dates Athletes. I think that baseball fans appear to be more laid back in America than in some other countries. In Korea, the fans are as energetic and entertaining as American football fans.